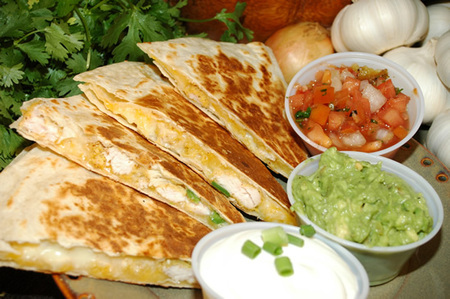 Personally, I love melted cheese and this chicken quesadilla recipe is simply to die for. I'm a massive fan of mexican food and toasted cheese sandwiches so this dish really gets me going. There are a million different recipes for Chicken Quesadilla so I though that I would just pick my favorite. It's delicous, easy and doesn't take too long to cook. Let me know how you get on ot if you have another quesadilla recipe that you think is better then I would love to here from you. Just follow the directions on this page to share you recipe with the world. First of you need to cook the chicken and shred it. Either under the grill or boilingit is sufficient. Ok, so shred the chickena and mix it in a large bowl with the cheese, soup, sprinkle of black pepper, and the jalapeno peppers. Fry up the mushrooms, onion and peppers untill soft and add to the mixture. Lay out a tortilla and cover half of it with this mixture. Fold the the other half over and squash down untill the mixture gets close to but not over the edge of the tortilla. Squash the edge to seal. Repeat untill all of the tortillas are used up. Sprinkle each one with the left over cheese. Bake the filled tortillas in the oven for about about 10 minutes at 200 C.
Cut each folded tortilla in half and serve with guacamole, salsa and sour cream.